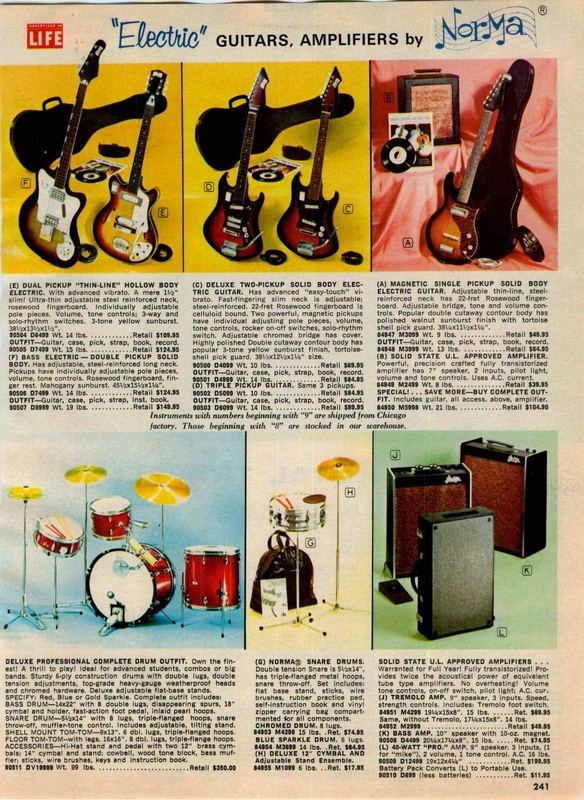 In the mid 1960’s, a wholesale musical instrument distribution company existed known as Strum and Drum. 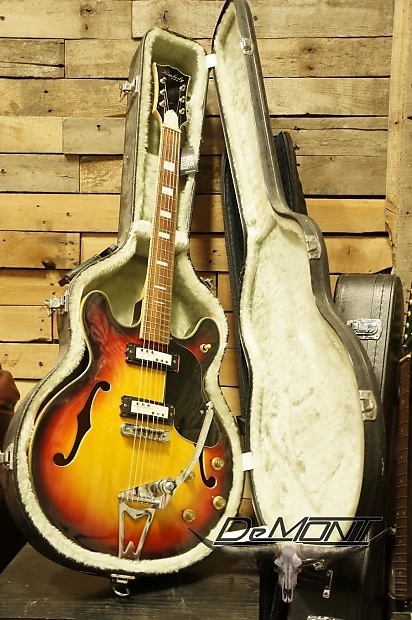 They were based in Chicago, Illinois and imported guitars from all over the world and sometimes re-branded them for sale to United States music stores, or anyone who owned a business and wanted to sell guitars. 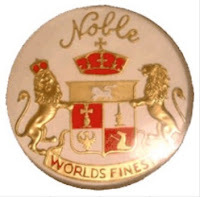 In the 1950's company called Don Noble and Co, was founded in the 1950’s by Don Noble, a well-known accordion player and entrepreneur. He began by importing Italian made musical instruments, mainly accordions, in an era when the "stomach Steinway" was very popular and accordions were being sold door-to-door, and accordion academies were common in most larger cities. But he also imported guitars under the Noble brand name. Somehow Noble became involved with business man Norman Sackheim. Eventually the name became Strum and Drum. 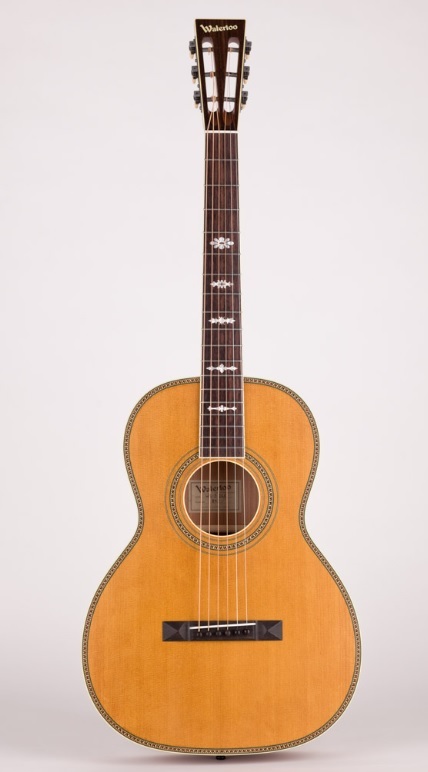 Between Nobel, and Sackheim they imported quite a line-up that included Italiian guitars from EKO, Avanti, Wandre, and Goya. 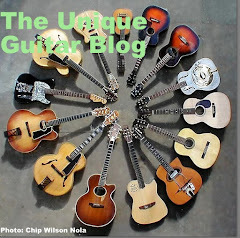 In 1969 Strum and Drum purchased the National Guitar brand name. 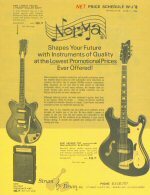 However from 1965 until 1969, you could find guitars with lots of pickups and switches under the brand name Norma, which was the feminized version of Mr. Sackheim’s name. He made certain the name adorned the headstocks of thousands of inexpensive guitars back In a time when everyone wanted to be the next big rock star. The logo was a stylized music staff, with the name Norma entered with the "N" as artistically designed 8th note. On some "high-end" models, the fret maker inlays were done in the letter "N". The manufacturing origin of these guitars is somewhat of a mystery, but for the most part they seem to have been manufactured at a plant called Tombo. We are for certain most of the fancier versions had their origin there. 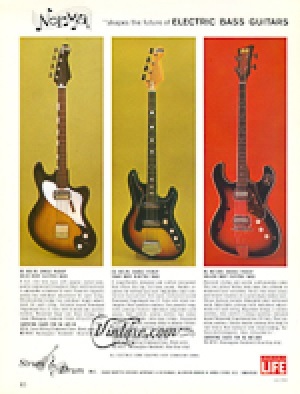 As an aside “Tombo” is the Japanese word for Dragonfly The company is still active, but no longer manufacturers guitars. They now specialize in harmonicas under the Lee Oskar brand name. 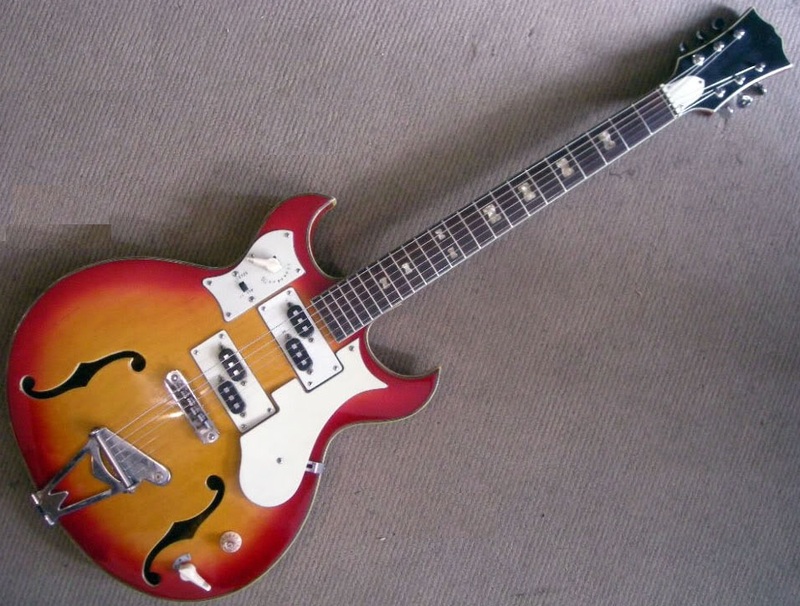 Some of the Norma guitars may have been manufactured by Teisco. The necks on these guitars were rather thick, possibly due to not have an adjustable truss rod. The single coil pickups are basic, and some guitars had as many as four pickups. Then there are switches and knobs; lots of them. 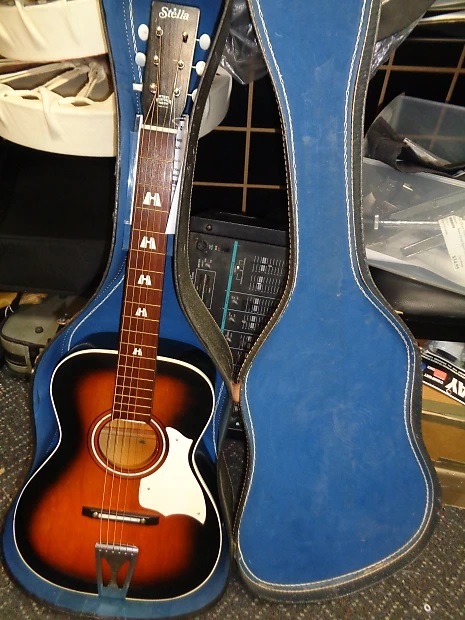 Most of these guitars and bass guitars were sold with a chipboard case, and retailed well below $100. Unfortunately after purchasing National Guitar, Norman Sackheim was killed in a plane crash while on a trip to Moscow. I know the company existed at lease until 1972. By far my favorite Norma electric guitar was their 12 string. 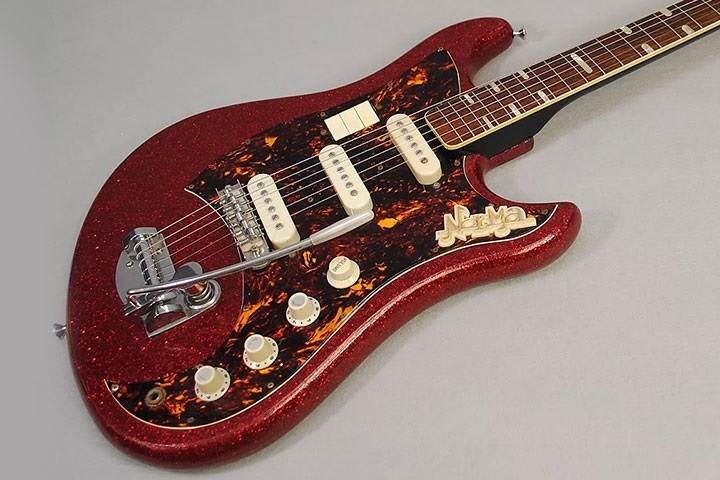 The body was based on an exaggerated version of a Fender Stratocaster. The headstock was an exaggerated version of a Rickenbacker 12 string. 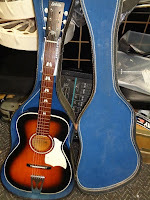 This guitar also came in a six string version with four pickups, lots of switches, and knobs. 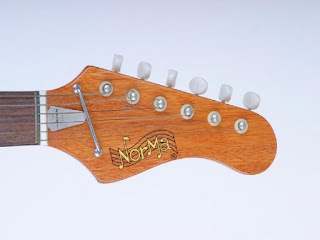 In doing some further research on Norma Guitars, I have learned that these guitars are prized by collectors, and are currently selling in the $800 to $1000 USD range. Click on the links under the pictures for sources. Click on the links in the text for further reading. 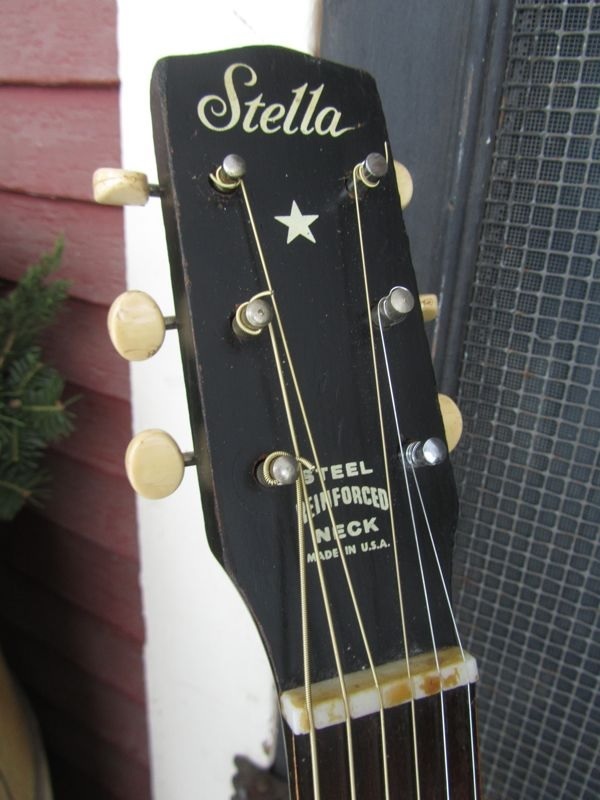 Stella was the model name given to a series of guitars manufactured by The Oscar Schmidt Company of Jersey City, New Jersey. 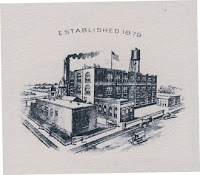 This company was established sometime between 1871, and incorporated in 1911. 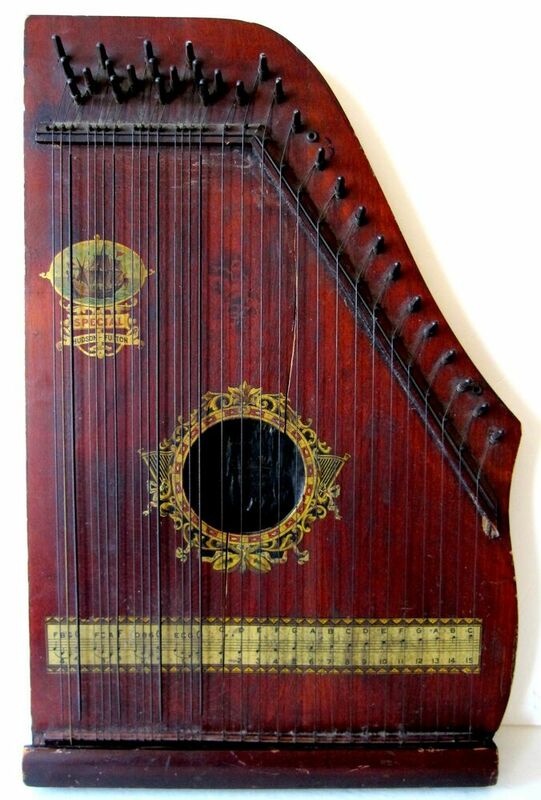 The Oscar Schmidt Company not only made some nice guitars, but manufactured a variety of stringed musical instruments, such as lap harps, autoharps, chord zithers, and something called a ukelin (which is a bowed psaltery made in the shape of a violin). While other instrument manufacturing companies would create instruments to be sold through department stores, or catalogs, usually under the store’s brand name, the Oscar Schmidt Company’s strategy was door-to-door marketing. Each year the company would offer a special edition of an instrument, which was sometimes linked to a current newsworthy event, Salesmen kept detailed records of the customers buying habits, with the intent of reaching out to this customer in the future. 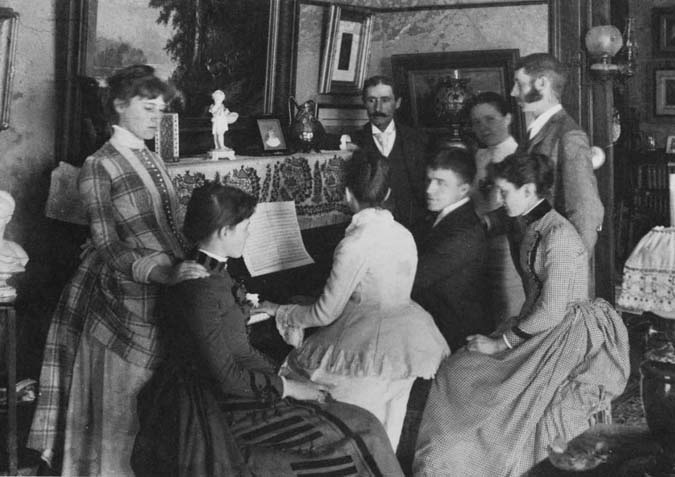 Most of the instruments produced by the company were durable, easy to play, and to learn on for beginners. During this era the only form of entertainment for families was outings, playing games such as cards, or playing music. 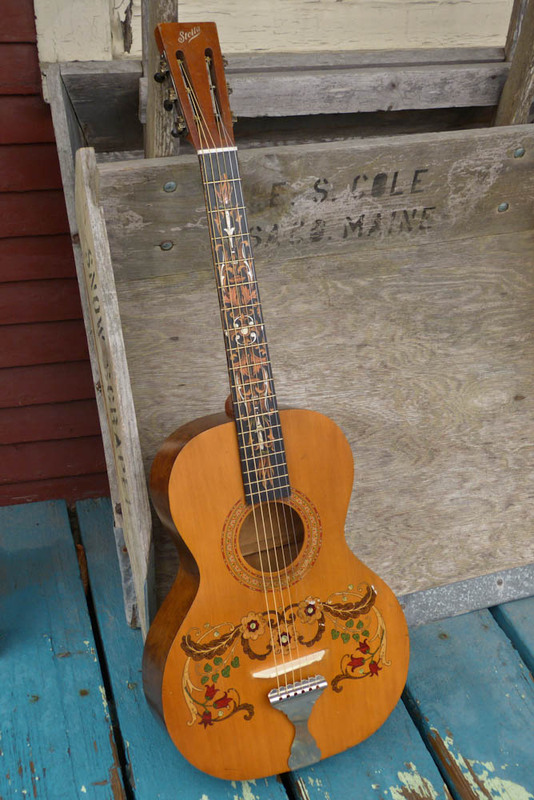 Playing music in the family room/parlor, was how the term “parlor guitar” was coined. 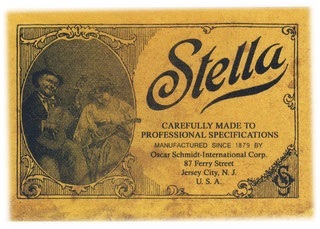 The company created the Stella brand in 1899 as low cost and mid level guitars. At the time the company had two other brands; La Scala, and Sovereign, with Sovereign being their top-of-the-line. 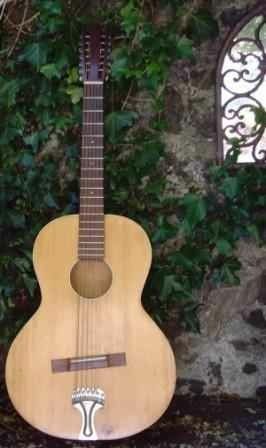 Stella guitars were made in various configurations, from parlor-sized, grand concert, even jumbo sized. 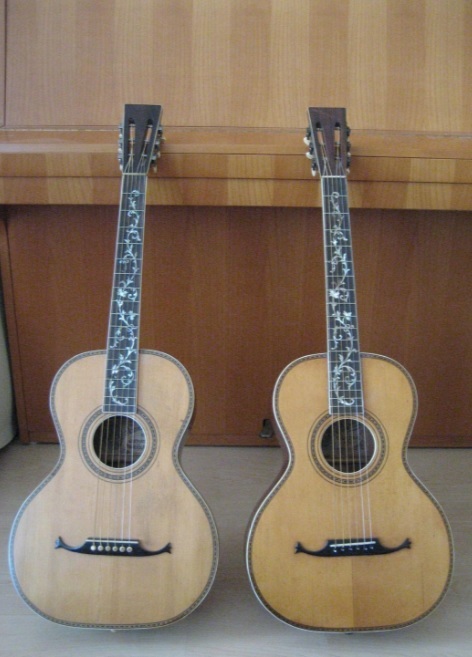 To keep the manufacturing cost down, many Stella guitars were made of solid birch. The nicer models were made of mahogany or German spruce. Despite the low cost, the wood was solid. Some of the tops featured unique decal designs. I've even run across those with decals applied to the fretboard. Stella guitars generally used ladder bracing. 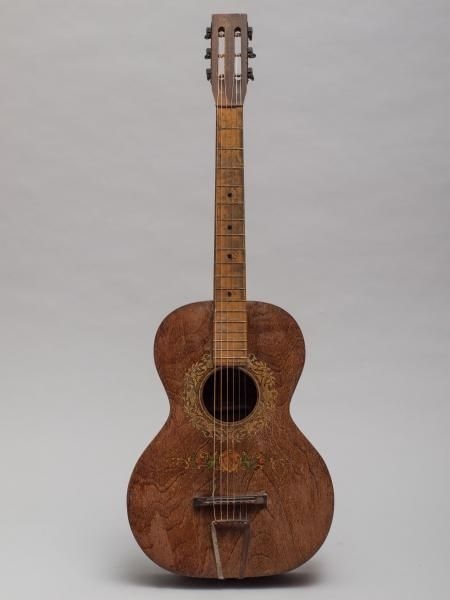 Most Stella guitars did not last throughout the years, as the interior finishing was rather crude, and quickly completed. 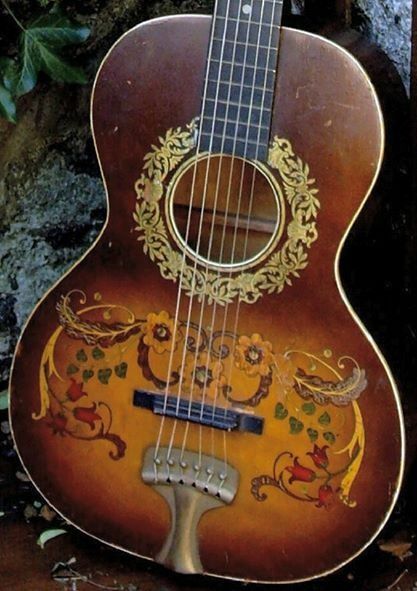 The bridges were made of rosewood, and on some instruments the strings attached to a trapeze tailpiece. 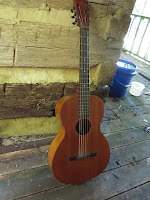 The fretboard was usually made of birch or maple and it was stained black. Unfortunately this stain caused some of the boards to eventually rot. With all that said, Stella guitars sounded great, and came with an affordable price; only $15 for a new guitar. This made the Stella an attractive guitar for Blues players of the day. 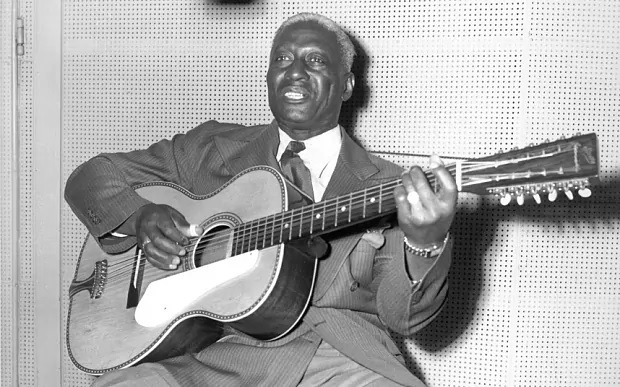 Leadbelly’s 12 string Stella (he called his guitar Stella, in the same way B.B. 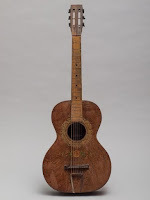 King called his guitar Lucille) provided a loud booming sound that could be heard In the Juke Joints or in the house parties during the days when amplification was not available, or deemed necessary. He tuned it down to B. 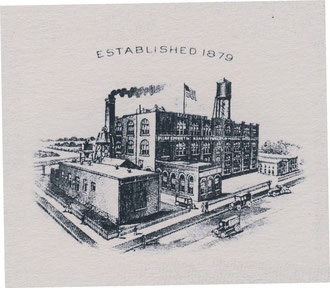 The Oscar Schmidt Company flourished for many years. At one point they even had five manufacturing facilities within the United States. Unfortunately the company did not last through the Great Depression of 1929. 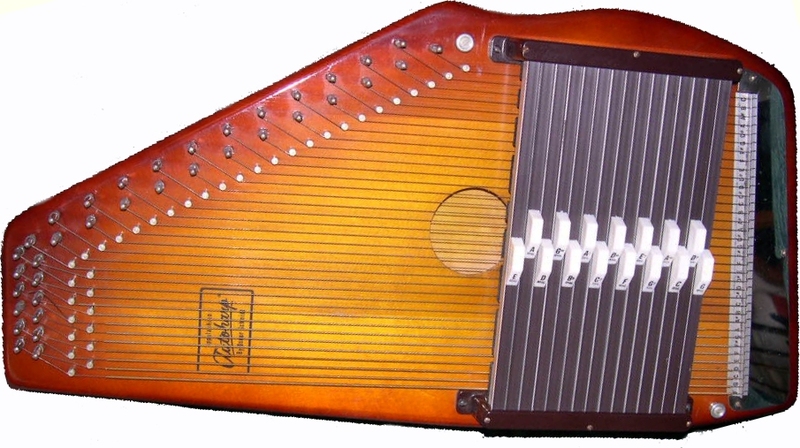 In 1930 the company’s assets were sold to the Harmony Company of Chicago, although Oscar Schmidt continued to manufacture and market autoharps. 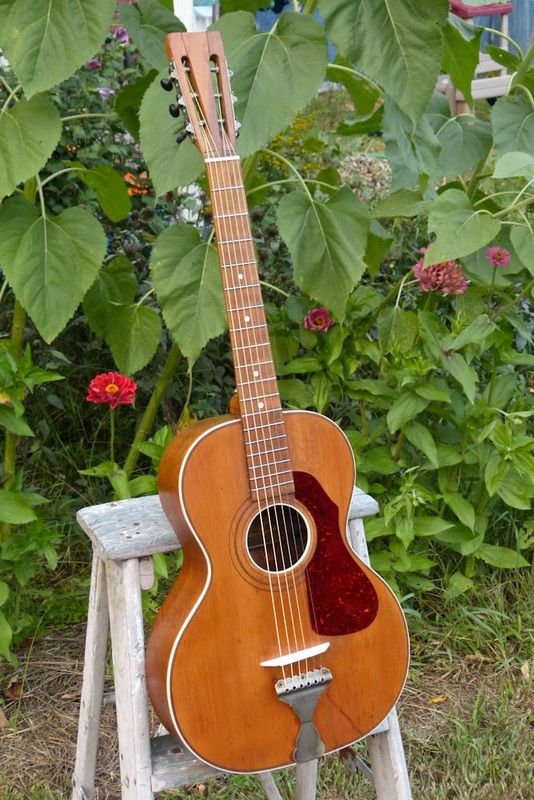 Most guitar aficionados will be more familiar with the inexpensive Stella guitars manufactured by Harmony, than those made by Oscar Schmidt. Many of these were made by Harmony using solid birch wood for the bodies, that was painted to appear to have faux flame. The tops were usually had a two tone sunburst. The necks were made of poplar. The headstocks proudly announced "Steel Reinforced Neck", although it was not adjustable. The position markers were painted on the fret boar. The machine heads were inexpensive, 3 on a plate, open gear style tuners. 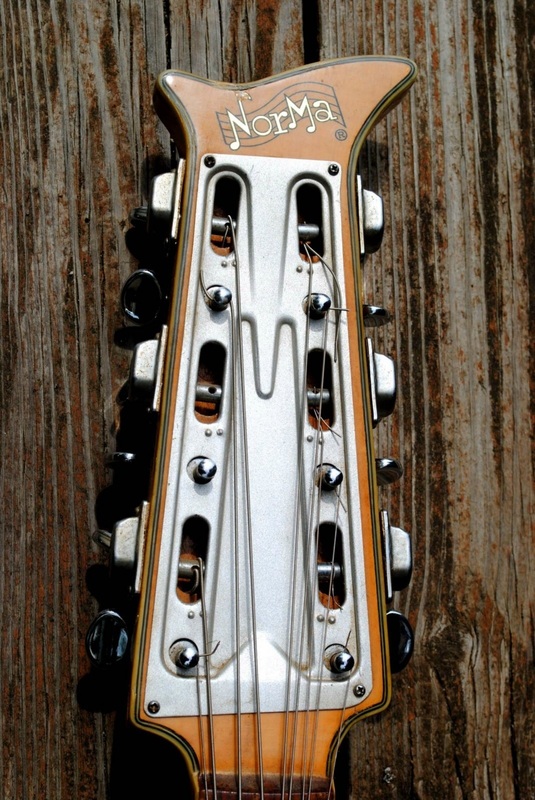 Most models had a stamped metal trapeze tailpiece. If there was a fixed tailpiece, it was screwed into the body. In later years manufacturing of some Stella-type guitars were built in Japan. These were beginner or student grade budget guitars. 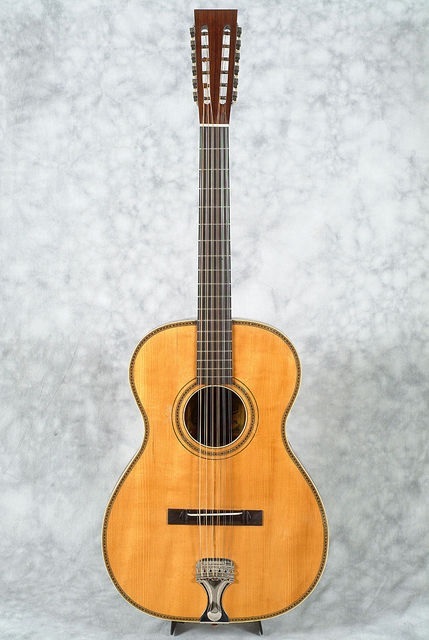 A four string tenor model was also available. 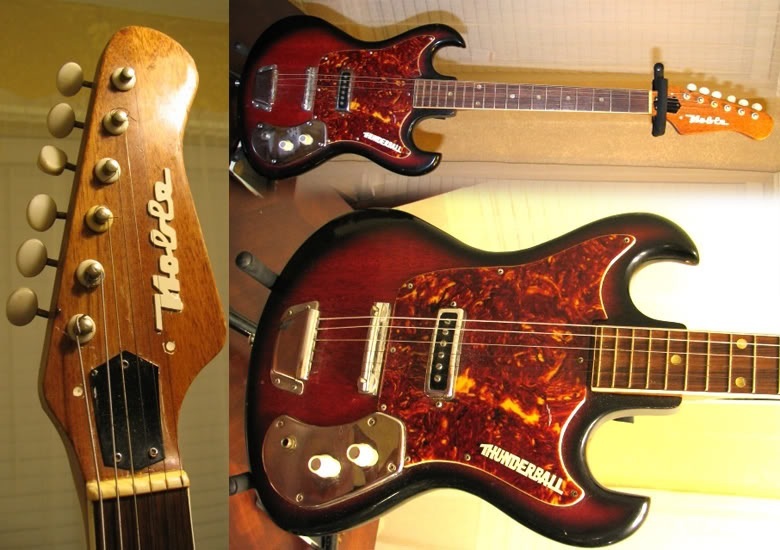 These guitars usually retailed for a mere $20.00 USD and were made by either Teisco, or Kawai in the mid-1960's. Essentially they were copying (although they refer to it as 'making a reproduction') of an already inexpensive USA made guitar. 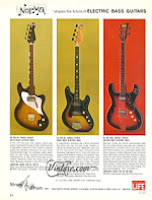 They were sold under the Winston brand name, and they were actually "badged" guitars, made for an import firm. 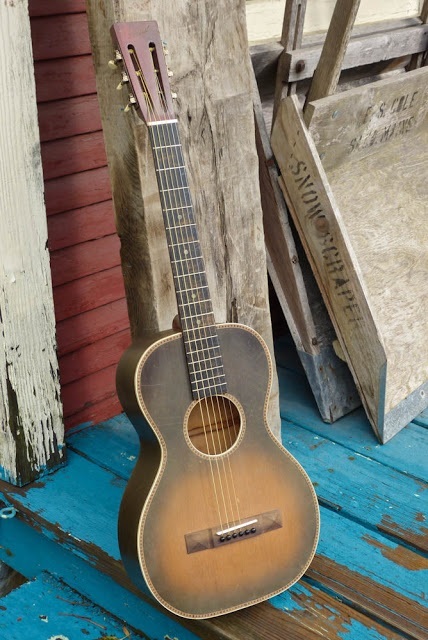 A few years ago, before his passing, luthier Bill Collings, of Collings guitars launched a new venture. 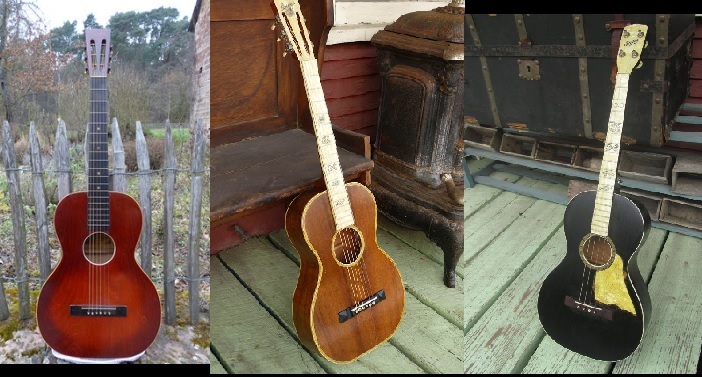 He wanted to recreate guitars made in the 1920's, that had "that" sound you would find on a guitar much like an Oscar Schmidt made Stella guitar and other brands of the era. So he founded Waterloo guitars. 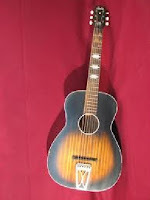 Waterloo instruments come in parlor to jumbo sized model guitars that feature ladder braced tops (with an X bracing custom option), necks with a V shape (this was an important feature on older guitars before truss rods were used), tops are spruce, backs, sides and necks are made of mahogany. 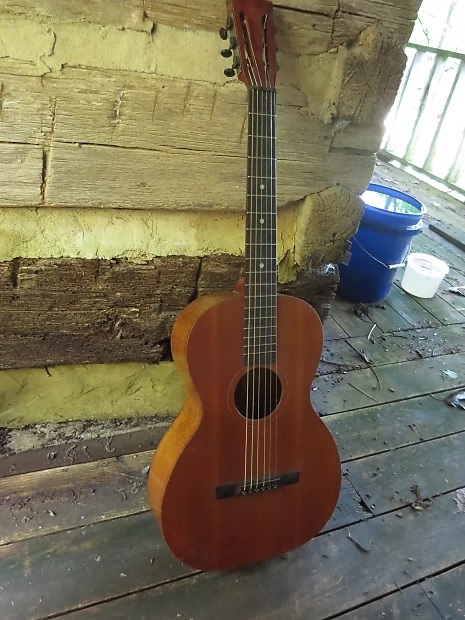 Instead of a $15 price for a new 1920 Oscar Schmidt Stella, with a $2.00 cardboard case, a Waterloo guitar with a custom hard-shell case will set you back around $2200. But they are very nice guitars. 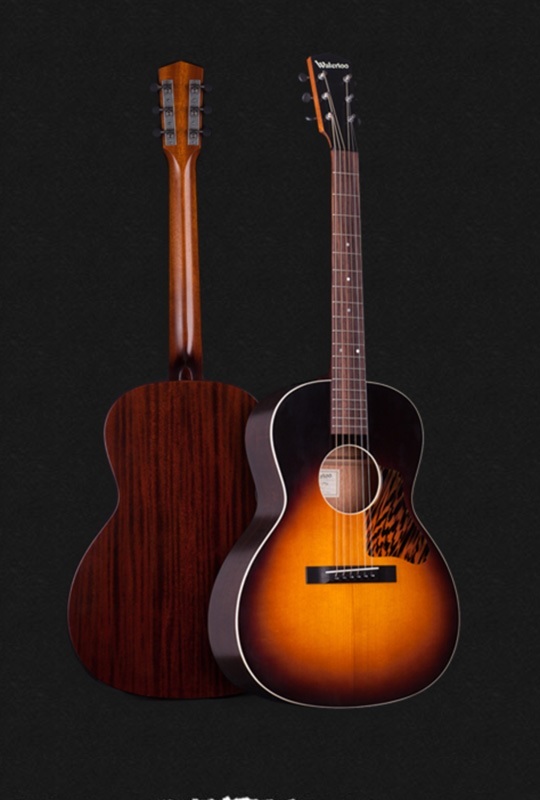 Currently the Washburn Musical instruments owns the Oscar Schmidt brand name. The company was formerly owned by musical instrument/electronics distributor U.S. Music, but was recently sold to the Canadian firm J.A.M Industries, which also is the wholesale distributor of musical instruments that are made abroad, and electronic musical equipment.